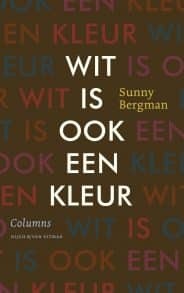 In ‘Wit is ook een kleur’ (White is a colour as well) Sunny Bergman shares her perspective on the complex issues that arise in today’s society. What is the deal with discrimination in the Netherlands? In what way is the white man considered as standard and how desirable is that actually? These are themes and questions I play or wrestle with almost daily on a personal and work related level. Sunny describes these complex social patterns in a very intelligent way. But it is not necessarily the content of her book why I would recommend it, I think this is a must-read because of the self-reflective element that is present in all chapters. In this reflection she dares to doubt her own truths. This makes the book in my view not a ‘radical left’ story, but a story about self-expression. To stand up for what you believe in and to be tolerant towards other opinions. The chapter ‘How tolerant are you towards intolerance’ is a wonderful example of that. This book inspires me to speak out and mention my doubts. To stay open towards other opinions. And to be honest to myself. My silence is often not because “everyone is entitled to his/her opinion”, but because of the construction of an invisible wall between me and the other. And these walls lead nowhere. It is necessary for change to continue to hear each other. And yes, that is my opinion.